Cars are not smartphones. A simple enough notion, but not one that most motor manufacturers seem to grasp. For proof, observe the rush to implement irrelevant and maybe even dangerous apps in the latest cars. You're nobody today without in-car facebook and twitter support. But I've reached the point where every time I see social networking support in the feature list of an in-car multimedia system, I have the urge to self harm. I can't take the nonsense any longer. In fact, I'd wager virtually nobody really uses that kind of integrated in-car social networking functionality. It's there so that car companies can stick it in brochures, make the spec list look edgy and up to date and to give salesmen an extra line or two for their showroom patter. Awful. 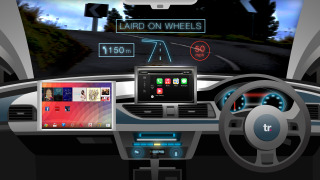 It's all part of a trend that's seeing car makers increasingly attempt to mimic smartphone and tablet functionality in their cars. Renault even has its own app store for its (dreadful) Android-based R-Link system. But somebody has got to put a stop to this silliness and rethink the direction of in-car multimedia. Tweeting and driving are simply incompatible. And if you're a passenger, you're far better off using your smartphone or tablet to browse Facebook, not a clumsy in-car system. More to the point, if as much effort went into creating genuinely useful apps as goes into ticking social networking boxes and the like, we'd have some really awesome apps by now. Instead, I'm struggling to count the number of excellent apps on the fingers of one hand. There's a good group of nav apps with Google Send-to-car topping that list - being able to plot out your route in comfort at home and then pinging it straight to your car is just fabulous. Likewise, being able to track your car on your phone can come in handy – but has limitations such as underground and multi-storey car parks. Ditto being able to lock and unlock your car remotely, which is offered by some manufacturers including BMW but obviously only works when your car has a cellular signal. Internet-connected multimedia apps like internet radio can be great but here we're beginning to stray into territory where such functionality is better handled by your smartphone. That said, you want seamless and intuitive control of such smartphone features in-car and on-screen, which several manufacturers including Mercedes have begun to grasp. Audi also deserves some kind of gong for its upcoming rebuild of the MMI platform as seen in the new TT sports coupé. Audi has done something very rare – taken inspiration from mobile devices and put it to good use. Specifically, what Audi has implemented is the global search function found in mobile Oses. No need to jump through endless sub-menus. Just start punch in an address and MMI will work out it's a navigation destination. That's genuinely useful in-car where digging through menus can be distracting for drivers and therefore genuinely dangerous. OK, that's not strictly an app, but then I am struggling for good examples. Anyway, overall, what's needed is a rethink of what actually works in-car. Apps that make driving more fun, finding places easier or doing something new that's actually useful. It's an issue that's been niggling away at me for some time and it came to a head when I had a play with the new GoPro app for BMWs in the M3 super saloon. It gives you control over GoPro's Hero cameras directly through BMW iDrive. It's not perfect, but it does offer unambiguous advantages – especially for the driver – over a smartphone as the control device in-car. It's the rare 'good' app like that that makes you realise just how pointless the checkbox apps including social networking truly are. As for ideas for better apps for the future, well, if I could answer that I'd be making my fortune in another way. But while car manufacturers continue to concentrate on pointless trinkets for apps, we're unlikely to find out.